A dental implant is used to replace a missing tooth and is a natural looking and functioning solution for lost teeth. At Northway Dental Practice, we offer our Maghull and Ormskirk area patients this advanced dental treatment which is permanent and hard wearing. We can also plan ahead for an implant if you’re having a tooth extraction. This helps to streamline the entire treatment and reduce your waiting time. It is important to replace missing teeth so that you can eat and chew as normal, enjoy a restored facial shape, reduce the impact on surrounding teeth and ensure you have a full and natural smile. Extensive research has shown that titanium is a metal that bonds extremely well with bone. When embedded into the jaw bone, after a time, the titanium integrates into the mouths oral system and is also exceptionally strong. 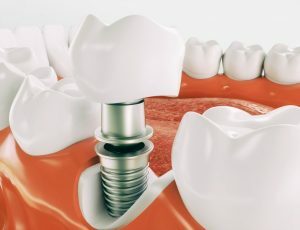 What will my dental implant look like? Your dental implant is created to look exactly like your natural teeth. It will be colour matched and shaped to resemble your remaining teeth and will be permanently fixed in place. Also, it will last a life time if cared for properly. To book a dental implant consultation, please click here or call 0151 526 2701 now.